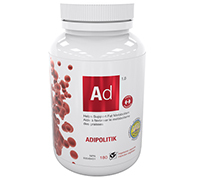 Adipolitik is a specific mix made up of 100 % high-efficiency natural elements which facilitate a quick loss of adipose mass without danger and without any negative impact on the adrenal glands. The North-American diet is very poor in antioxidants and very weighted in sugar. In the long run, this type of diet has rendered the body very lazy and not very receptive to losing adipose mass. Indeed, adipose cells become more and more abundant and two key hormones essential to weight loss, adiponectin and leptin, have their secretion unsettled. This chaotic environment renders weight and appetite control nearly impossible without enormous sacrifices. With the help of Mother Nature and a slight push from science, ATP has developed Adipolitik. Carnitine has a very important role within the organism; it is required for transporting fatty acids towards the mitochondrion (cellular energy factory) during their decomposition. Carnitine as a supplement enables the increase of glucose oxidation and the reduction of insulin resistance, thus allowing for better control of glycemia, facilitating the loss of adipose mass. The quantity of available carnitine in the human body is a limiting factor in regards to fatty acid oxidation. By reducing muscular glycolysis, it allows for more glycogen to remain in the muscle for promoting fatty acid oxidation as an energy source. The extract from the non-roasted coffee bean is very similar to the coffee bean we know. The big difference is the level of chlorogenic acid content, which is much greater in the non-roasted green bean. Indeed, chlorogenic acid diminishes the chances of developing diabetes by increasing the transport of glucose towards muscular tissue. It also reduces glycemia on an empty stomach and favours weight loss by facilitating fatty acid oxidation. This phenolic compound, occurring naturally in minute amounts in raspberries, is really one of the new superstars for the loss and control of adipose mass. Indeed, its properties favour lipolysis (fat burner) and better fatty acid oxidation, and could even increase sensitivity to insulin and favour a higher level of leptin, this being the hormone that diminishes appetite and increases metabolism. (Cortisom and Lipidrium 2.0 also optimize the level of leptin). Raspberry ketones favour the secretion of adiponectin, a hormone secreted by adipose tissue in certain situations, like when exposed to cold. The rate of adiponectin secretion drastically diminishes in obese individuals, which reduces the possible use of adipose tissue as an energy source. The consumption of this fat and water-soluble antioxidant beyond compare has been known for its many health advantages for decades. Thanks to its action on one of the main cellular energy metabolism regulators (AMPK), it enables the increase of sensitivity to insulin, the reduction of triglyceride accumulation in the skeletal muscles, facilitates glycogen storage at the muscular level and increases oxidation of fatty acids. The seed of the wild mango tree is becoming more and more popular for favoring weight loss and maintaining good health. Its effects on adiponectin and leptin are indeed very interesting. The consumption of this extract is purported to increase sensitivity to leptin as well as insulin. It allows to reduce the conversion of glucose into triglycerides by inhibiting glycerol-3-phosphate dehydrogenase (the necessary enzyme for converting glucose into triglycerides for storage in adipocytes). A trace-element present in minute amounts with enormous benefits. This little health giant helps reduce insulin levels, positively influence carbohydrate, lipid and protein metabolism and increase sensitivity to insulin. This spice with the divine aroma, which recalls all of our dream desserts, turns out to be a health champion. It has been shown that its regular consumption increases the transport of glucose and would favour a more stable glycemia, thus reducing sugar cravings. It also reduces blood triglycerides as well as bad cholesterol (LDL). Furthermore, it is a very powerful antioxidant. Recommended Use or Purpose: Helps support fat metabolism. Helps to promote healthy glucose metabolism. Provides antioxidants for the maintenance of good health. Helps the body to metabolize carbohydrates. Recommended Dosage: Adults: Take 2 capsules 2 times a day. Recommended Duration of Use: Consult a healthcare practitioner for use beyond 6 months. Risk Information: Do not use if you are pregnant or breastfeeding. Do not use if you have diabetes.